Bathroom Remodeling: Do You Need New Toilets? Remodeling your bathroom typically means a radical overhaul of your existing design. Although you might think it only involves new lighting, a new tub, or adding a towel warmer, you can’t overlook the importance of new toilets. Remodeling your bathroom typically means a radical overhaul of your existing design. Although you might think it only involves new lighting, a new tub, or adding a towel warmer, you can’t overlook the importance of a new toilet. If your current toilet no longer functions or is falling apart, then it might be time to find a new one instead. When given a choice of the toilets to install in your home, you’ll find two-piece toilets most often. All across America, this is the most popular type of new toilet. The two-piece in the name refers to how the tank and the bowl are manufactured separately before being joined together when it is being installed. Due to how large and heavy they are, installing a toilet yourself can be frustrating and difficult. That said, when you need to clean them, it won’t take all that much effort to do it. If you have several adults sharing the same bathroom, then a two-piece toilet is the best choice. Even if you have more than one bathroom in your home, this might still be the best call. Alternatively, you might decide to install some one-piece toilets. One-piece toilets are easier on the eye and easier to clean. They might be more expensive than their two-piece counterparts, but with that bump in the price, you can expect a toilet that is more durable. Plus, they are ideal choices for half-bathrooms or guest bathrooms that don’t feature a shower stall or bathtub. Sometimes, remodeling your bathroom is done so you can expand the available space. Until that process is complete, you might have barely any room to move around. In these cases, wall-mounted toilets are the best fit. These toilets are attached directly to the wall, meaning the tank is concealed behind the adjoining wall. All you need is a convenient water source to keep the toilet running smoothly. However, one major consideration to think about when you’re remodeling your bathroom is how much that these models tend to cost: they are vastly more expensive than either one-piece or two-piece toilets, and it will require more frequent servicing, meaning more visits from your plumber. You can also add smart toilets to your home. With the rise of smart appliances such as refrigerators that can show you the contents, or dishwashers that automatically run once they are full, it isn’t too much of a stretch to get a new toilet that caters to your needs and improve your comfort in the bathroom. 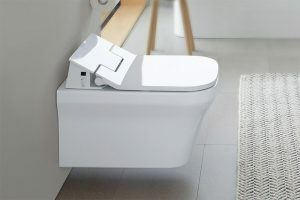 Two examples of added comfort are heated seats – great for the chilly days of autumn and winter – and automatic flushers that you might have already seen in toilets in commercial spaces. No matter what type of bathroom accessories and fixtures you choose, WalterWorks Hardware has the expertise and supplies you need. We are well known throughout the Maryland, Washington, D.C., and northern Virginia area for our fantastic hardware and unbeatable knowledge. For more information, please give us a call at (410) 263-9711 or contact us online. For more tips on choosing hardware for your home, follow us on Facebook, Twitter, LinkedIn, Houzz, Google+, and Pinterest. Cities we serve include Annapolis, Baltimore, Columbia, Ellicott City, and Washington, D.C. This entry was posted on Wednesday, October 3rd, 2018 at 10:16 am. Both comments and pings are currently closed.